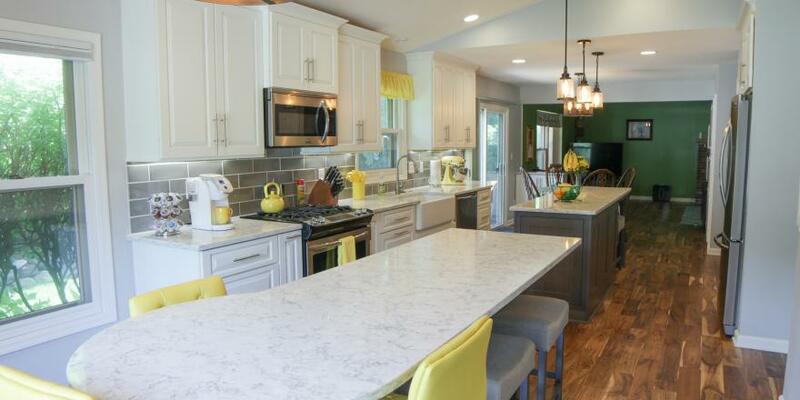 This project included renovating the kitchen, dining room and entire first floor flooring. The goal of the renovation was to remove a wall separating the dining room and kitchen to make space for entertaining. An open concept floor allowed the space to accommodate a more functional floor plan. In the kitchen area, two long islands give the homeowners plenty of counter space and seating. The kitchen features custom cabinets, LG Viatera countertops, vaulted ceilings, and engineered Acacia wood flooring. The end of the room includes a wet bar with a beverage refrigerator, wine rack and beautiful tile backsplash.